which is blessed by their contact. they cast an amber shadow at my feet. The Buddha is not for worshipping! of that creation, must worship myself. as others do, as others see them. I love the lighthearted and whimsical nature of this poem! I also like the profound teaching in the poem that the "Buddha is not for worshipping, the Buddha is merely for being." Buddha means the "awakened one." Within all of us there is what is called "Buddha nature" which may be interpreted as our "true nature." We already have the perfected state within us for that is our true nature - our true essence. To deify the Buddha as something separate from us is to miss this teaching! Both the poem and the painting seem to combine a the sense of sacred presence and the joyfulness of experiencing life in the moment. There is a dynamic off-centeredness in the painting that gives it energy and makes it interesting to look at. Thank you Emma for sharing this wonderful poem and painting. Joseph, thank you for what you say here. It is the reminder of our true nature, in the sense which you mention, that we are all the Buddha, and the Buddha is us. The mystics recognised this profound truth. Julian of Norwich's declaration that she WAS Christ was not blasphemous, nor even presumptuous, but a realisation of this truth. It is not 'there but for the grace of God go I', but 'there go I': we ARE the other. 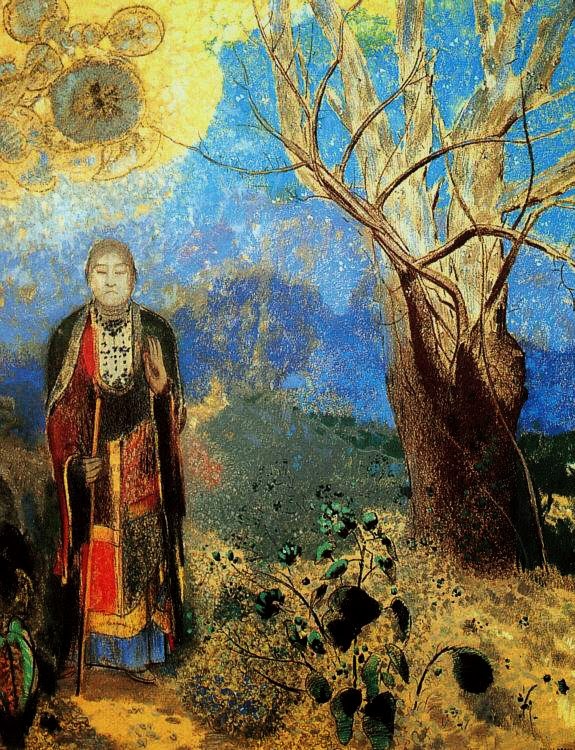 And I'm so pleased that you enjoy Redon's painting of the Buddha as well. It was actually his painting which inspired my poem!